Convoke and 2 colour creatures? 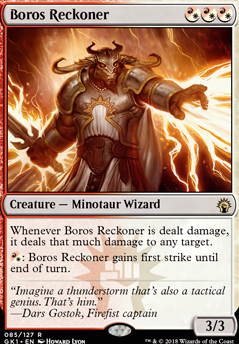 : Boros Reckoner gains first strike until end of turn. Lots of redundancy is something you don't have deck space for in your deck therefore I would start with cutting cards that are redundant. Basandra and Flail are less needed since you've added Abolisher. When you have such little deck space for a Sunforger package of instants Stance doesn't do enough, Boros Charm and Plowshares are better options. Sword of BnM is the least good Sword since opponents have 100 card libraries and graveyards are a huge resource for most Commander decks. Crusader and Paladin are similar and I think Paladin is better because of soulbound, he can pair with Aureila and double strike Aurelia is good. Aurelia EoJ, Reckoner, Figure, Avenger and Tajic are fine creatures, but that's all they are. There's nothing really special for your strategies here about these cards. In a game you would be better off drawing and playing other cards. Liege has a nice repeatable ability, but I don't think you need it and it's lackluster for a five drop. Thank you all for the comments and upvotes! Bird Leaf is now the #1 most upvoted Feather list on Tapped/Out, and for that I am grateful. I caved to the demands for Sunforger. I am now focusing on tokens to enable more fun interactions. I started a rough description. It will explain what's going on. Now! To direct responses! I might not get to everyone, if I do not, thank you for commenting anyway! IAmTheWraith thank you! I have taken your suggestion in! whalen147 Thank you for your comment! Since I've decided to go more tokens I've added a few of your suggestions, and ended up cutting most of what you suggested, besides Magnetic Theft because I broke down and added Sunforger. Thanks! landofMordor thanks! I added a small blink theme and Long Road might find it's way in! Appreciate you looking at my decks! bushido_man96 hello friend! How long have we been brewing Boros together? Since Brion Stoutarm? Hahah! I Have added Sunforger, your argument being a key factor. Thanks for the compliments and upvote! Chandra585 yes, my unhealthy love of Boros is really paying off recently. Thanks for the suggestions! bmbowdish hello braden :) As you will no doubt see on discord, I caved and added sunforger haha! ZendikariWol you are welcome! Intimadation Bolt is a personal favorite! Flawless_Sin nice list, love the wishboard! v1talsign thanks for the input! With the addition of Sunforger and knowlege of my meta, I believe Magnetic Theft is a solid card here. Odimeer I like the idea! 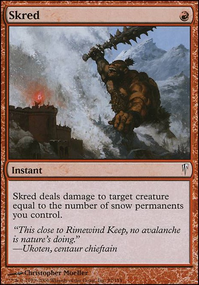 Have you considered the other redirect damage creatures like Spitemare and Boros Reckoner ? Maqi I like Reckless Rage and might find a slot for it, but when it comes down to it a path or Swords is just better. SpookyToe while I ended up adding Sunforger, I appreciate your words and your view of commander. Thanks a ton! cmsrDPM Added A&C! Not so hot on Spark. Thanks! That's all! Oh wait-that's a lot haha! Thanks for the upvotes and comments! Keep the discussion going! 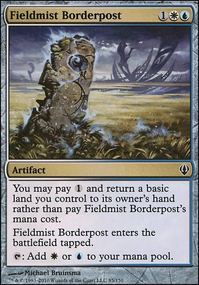 Looking for the wonkiest and weirdest ways you've won a game of standard. My own story was during Return to Ravnica standard and I ran a Mardu creature-based midrange homebrew I'd put together that utilized creatures like High Priest of Penance , Boros Reckoner , and Vampire Nighthawk to stall the early game and to get in chip damage. Undying Evil and Boros Charm were my only non-creature spells. My opponent was at 10 life and I was facing down 3x 8/8 vigilance tokens from Grove of the Guardian (and populate) and 2x 2/2 vigilance tokens that were all getting +3+3 from Collective Blessing . This was the first turn my opponent could go wide enough to ignore my only creature. All I have on my end is an untapped Boros Reckoner and I'm at 12 life. 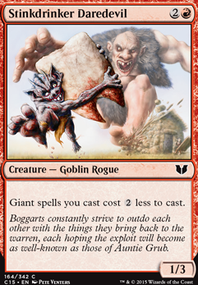 I'd actually been waiting for this moment, I cast Boros Charm targetting one of my opponents 11/11 tokens... to give it doublestrike, block it, and redirect the first strike portion of the damage to his face before normal combat damage ever happened. My opponent was butthurt to say the least, but the initial 'wtf just happened' look was priceless.